One day, Retsu Seiba and Go Seiba, the brothers who are in mini 4WD toy racing, received specially customized mini 4WD toys from Dr. Tsuchiya. 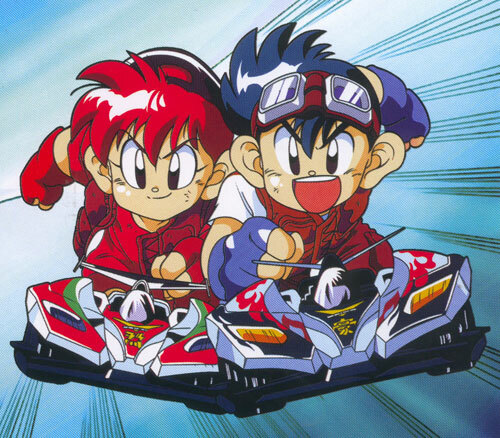 "Sonic Saber", which is specialized in cornering, is given to elder brother Retsu. "Magnum Saver", specialized in speed, is given to Go. Participating in a preliminary match of Great Japan Cup, they need to be in top 3 in order to proceeding to final match. But unexpectedly one of their 4WDs crashes in the middle of racing. When Go is about to give up, miracle happens. Retsu's Sonic Saber saved Go's Magnum Saver. Finally their 4WDs arrive at the finishing line with a lightning speed, and Retsu finishes in the first place and Go finishes in third place. But real challenges are waiting for them. © 1996 SHOGAKUKAN PRODUCTION. ALL RIGHTS RESERVED.